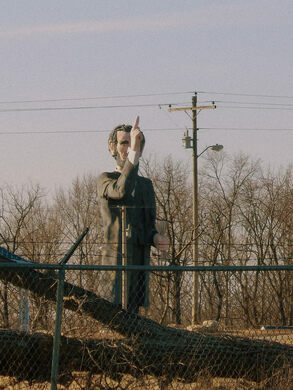 Sorry, World's Tallest Lincoln Statue is permanently closed. 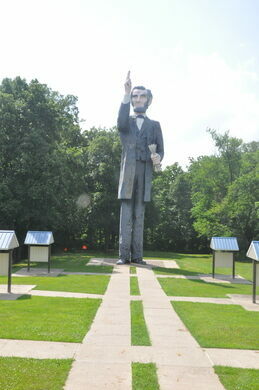 In the “Land of Lincoln” stands one of the world’s tallest Lincoln statues. He stands at an impressive 72 feet tall, towering over nearby trees and buildings. Former hotel turned into haunted playground. Perhaps because of this derision, the statue has been the subject of much vandalism over the years. He is riddled with bullet holes, and his extended index finger has been blown off several times. The statue was dedicated for the surrounding park in 1969, but the developers soon ran out of money and the park project was abandoned. The park and the Lincoln statue have been renovated and repurposed several times. First, it was as Spring Haven campgrounds, then as the Lincoln Springs Resort, both of which closed. 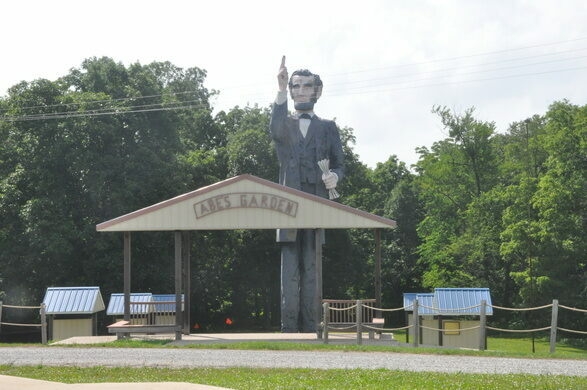 Most recently the park was “Lincoln Gardens,” where numerous chainsaw-hewn sculptures depicting the 16th president at different points throughout his life stood scattered around the tallest of them all. Update May, 2017: The area is gated with no access. The place is for sale now, so access is cut off. You can still see the statue from afar, but not close up. Good ‘ole Abe is really off the beaten path. While rounding a corner on the old County Road 2000 E, you can see his large head peeking over the hill. The legacy of an unsolved, gruesome murder rests beneath the spans of this historic bridge. This grave in a ghost town cemetery marks the death of a witch on a day that never happened. The 40-year-old machine serves soda quicker than you can catch it for a mere 75 cents a pop.